I’ve had a craving for onion rings for weeks now but I haven’t wanted to make them because I hate the mess frying creates. I have a recipe for oven fried chicken that’s really good so I thought I could do something similar for onion rings. I dipped the rings in milk and then in some flour I had seasoned with a little salt and pepper. 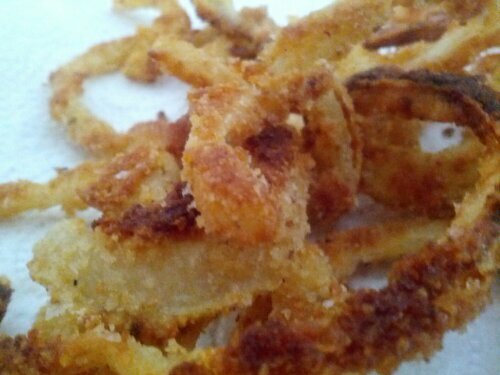 I whisked a couple of eggs to dip the floured onion rings in and then coated them with bread crumbs. I preheated the oven to 450° and coated my baking sheets with olive oil. After coating the onion rings, I put them on the oiled baking sheet but before putting them in the oven, I flipped each one over so they’d have oil on both sides. I baked them for 10 minutes and then flipped each one over and baked them for 5 minutes longer. That’s all they took to cook! 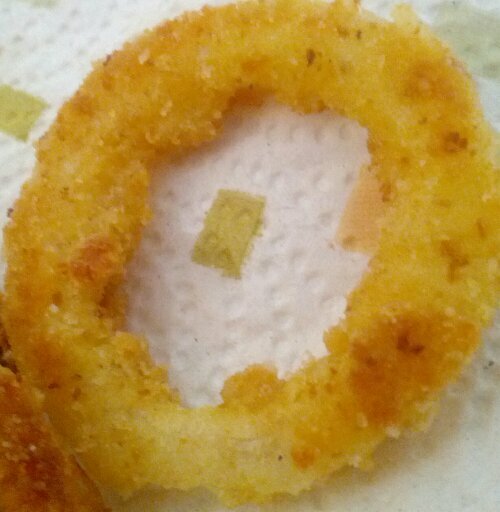 (My onions are small so these weren’t very big onion rings – bigger rings would take longer.) The onions were perfectly tender and the outside was crunchy. Not like fried, but good enough to satisfy an onion ring craving. 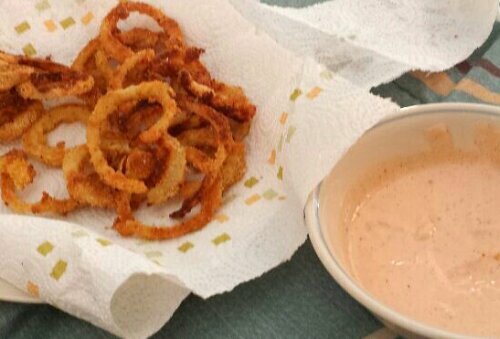 I made a copycat Bloomin’ Onion Dipping Sauce to go with them – but I think I will look for another recipe in the future. The one I used wasn’t spicy enough. It was sweet, not like the real recipe which has a little heat. So now you know you can make pretty decent onion rings without frying. Give them a shot if you have an onion ring craving.